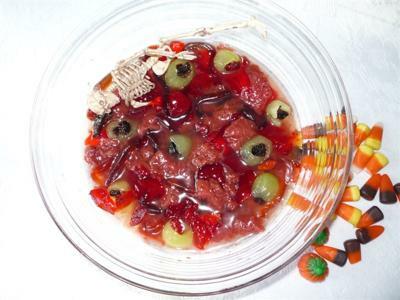 Make BLOOD AND GUTS for a super gross Halloween dessert. Crush the canned strawberries with a fork until stringy and squishy looking. Add some squashed raspberries (guts). Push the blueberries into the ends of the grapes (make eyeballs), add them to the guts. Put in some lengths of fruit strings (veins). Add blobs of gelatin. Mix gently. Then chill until the veins swell slightly. Then squirt raspberry ice cream sauce gently through (blood) before serving. Best to make in the serving bowl, so not to over mix. Good served with Witches Wee's (home made apple juice -made in a juicer, but not perfectly clear)! I have also made Blood and Guts drink - just add ingredients (without the sauce) to Raspberry drink. Your weird dessert was gross but tasty, the halloween party was fun. Great job. This sounds like it's be the healthy and fun! - What a winner!!!! This looks so good - I think it's be a fantastic addition to any Halloween party. This was the best thing at our Halloween Party last year!